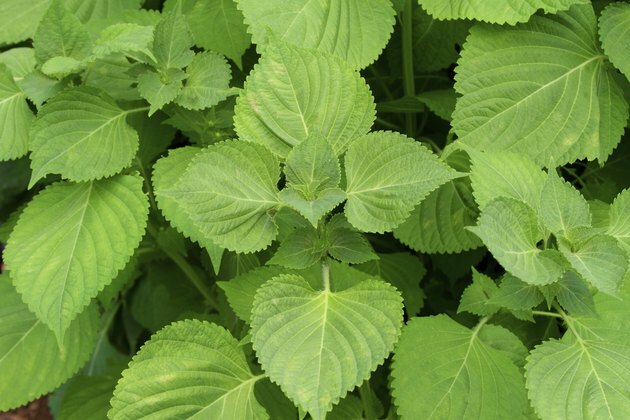 The leaves of the perilla plant, which is an herb, may be an effective ingredient to add to your meals, as Drugs.com notes that perilla is purported to prevent food poisoning. These leaves may also have anti-inflammatory effects and are said to promote healthier cholesterol levels. However, Drugs.com notes that there is not adequate clinical evidence to support these claims. Regardless of these effects, perilla leaves do have nutritional content. Consult a doctor before using this or any other alternative forms of medicine. Perilla leaves are low in calories, as each 100 g serving of the leaves provides just 37 calories. This number of calories composes less than 2 percent of the total suggested daily intake of 2,000 calories. Although perilla leaves are low in calories, they are higher in calories than some types of leaves; 100 g of lettuce contain just 15 calories. Although many leafy vegetables are fat-free, perilla leaves contain 1 g of fat in each 100 g serving. None of the fat in perilla leaves comes from saturated fat, a type of fat which may increase your risk of heart disease. Dietary fat is vital for proper health, so the Department of Agriculture recommends consuming between 20 and 35 percent of your daily calories from fat, but no more than 10 percent of your calories should come from saturated fat. Perilla leaves are rich in carbohydrates, with 7 g in each 100 g serving. Perilla leaves are free of sugar and provide 7 g of dietary fiber per serving. Due to the rich fiber content in perilla leaves, this type of food may aid in weight loss, as fiber promotes satiety. Fiber also promotes healthy digestion and may aid in the treatment of diabetes and heart disease, so you should consume 20 g to 35 g each day. Perilla leaves do not contain any protein. Protein is a vital nutrient that promotes the health of your body's cells and tissues, among other roles. Perilla leaves contain some minerals, with 23 percent of the daily suggested intake of calcium and 9 percent of the daily suggested intake of iron in a 100 g serving. Perilla leaves are rich in vitamin C, with 43 percent of the daily suggested intake in a 100 g serving. Do Celery Leaves Have Nutritional Value?